Hey friends! I was just wondering that not everybody is an expert in setting up his or her kitchen. But once you go into a relationship or get married, you have to keep your kitchen well set up so that it may help you to save a lot of time and gives your kitchen a clean and elegant look. I was really surprised to know that some people do not even have the idea of placing the utensils into which cabinet and how to arrange different spices and platters. So I will be giving you a few ideas which will help you set up your kitchen in a better way. A basic kitchen item: silverware. To start with the basics, the first thing you need is a well designed kitchen. If your kitchen is not designed in a way that it has either a dishwasher or a sink, then this article will be of no use to you because I will be telling you how to manage your kitchen that has a sink or a proper dishwasher. The basics include the silverware. These need to be placed in a drawer located near and a little above your dishwasher because you always want to put the silverware somewhere out of sight and only delicate things are placed on the shelf as they look really nice. I recommend that if you have an island then you should put the silverware drawer in the island but it should also be a little away from the sink. If these things are not available, you can purchase a reasonable silverware organizer. If it is a beautiful looking container, it will make you happy when you will open your drawer and see your silverware beautifully set inside a nice looking container. If your kitchen is poorly designed, you may face problems in placing away your silverware and then searching it back at the time of need. Looking for where to put everyday dishes? If your kitchen has more than one cabinet, then you are really lucky because you get many choices for putting your glassware and dishes. First check that which way your dishwasher door opens and then put your dishes and glassware in the cabinet which does not form a hurdle in its opened door. If it opens to the right, put dishes in the left cabinet and if it opens to the left, put them in the right one. not have wall cabinets. That can also do. But if your kitchen has wall cabinets only or vertical cabinets then you can either place them in a storage cabinet with a front door made of glass or you can also a stall hutch just like a style that furniture has. 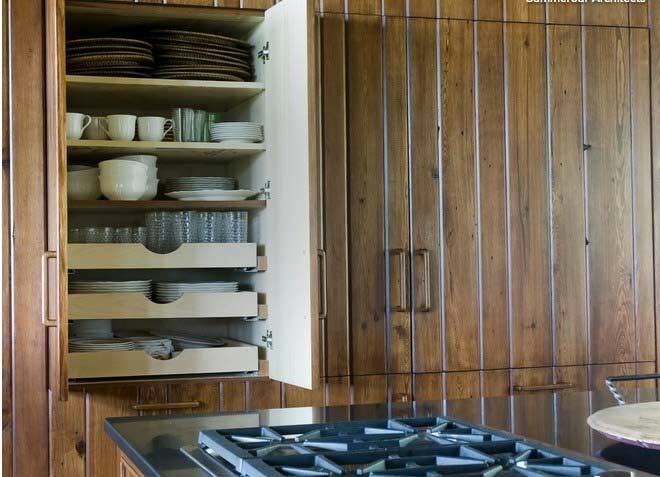 If the storage capacity of your kitchen cabinets is less, then having drawers will be really advantageous because drawers can accommodate many utensils at a time. You can easily take out a stack of dishes or plates and set them for your guests at the table. A nice little space for large bows, wine and cookbooks. There is a very cool idea in my mind for a cabinet that is located above your refrigerator. You can set it in a way that it does not have a door. You can put some cookbooks or a wine rack in it. Some cool looking serving bowls will also look very chic. 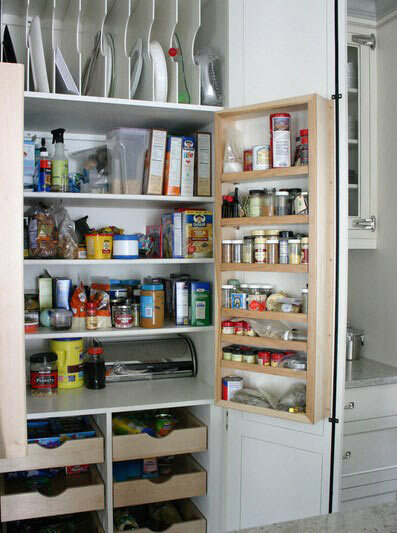 This not only fills up the idle space but also provides best possible space for things like handbooks and recipe books. Places where your knives and spices can go. These small but numerous kitchen items need to be placed in such a way that you can use them daily with ease. Put them back in the place and remember where everything is when you need it again. 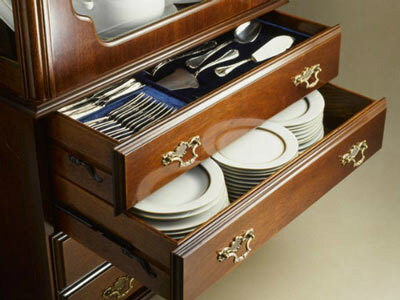 For these purpose, you can either fit a wall rail system for serving spoons and knives, or a silverware organizer. For bowls and pots you can purchase a pot rack or you can place them in open cabinets. They can also go under the island or to the baker’s shelf. For spices, a nice looking spice drawer can be purchased and placed on the shelf beside your cooking range. 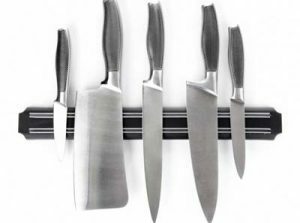 A knife holder or a magnetic knife bar will not only make it easier for you to find and use the knives but will also free up some cabinet or drawer space which you can use for some other items. Sauces, oils, vinegar and tall bottled spices. necessarily go to the pantry because it will be difficult for you to go and take out the required bottles and go back again to put them back. All these bottles should be placed in one cabinet. If you have a kitchen cabinet between your cooking range and the sink; that would probably be the best place for these tall bottles. If you put your pots and pans in any drawer, it will cause you problems because you may have to pull out the pans and reach the pot that you need. This sort of thing makes me really annoyed. That is why I prefer roll out shelves. These are shallow and the things can be put into them in an organized way. Thus lot of time gets saved. If you do not have roll out shelves in your kitchen, you can pu the pans and pots under the cook top. With a cooking range fitted between the cabinets, any of the cabinets to the right or the left is also fine to accommodate them. But the cabinet size should be large enough (Between 2.5 feet to 3 feet minimum). Beneath the island is also a good place but if there is no island then put your utensils in the cabinet perpendicular to you. 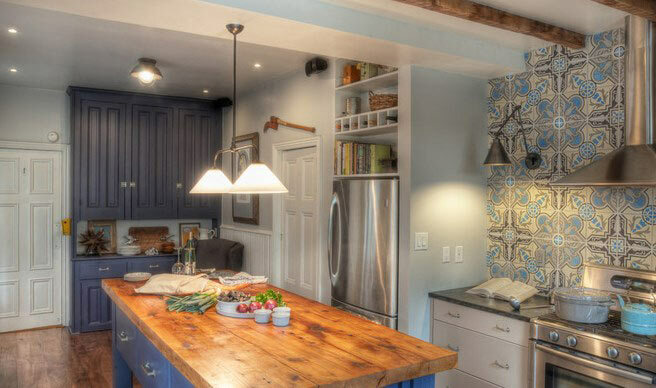 Do you have a small kitchen and you are worried about the space issue? Do not worry because a pot rack will solve this problem for you. 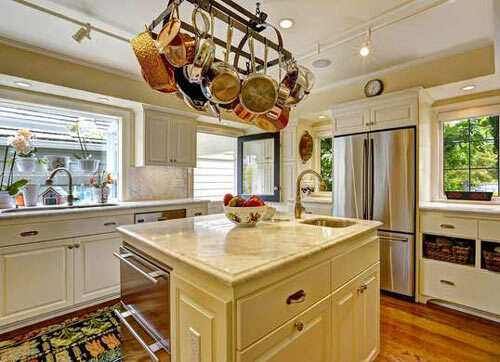 Even if you have a small kitchen and there are no roll-out cabinets, a pot rack will help you accommodate all the pots and pans easily. These can fitted to the wall too, can be bar styled too and can be ceiling pot racks too. Imagine opening a wall cabinet and getting something toppled out of it on your head! Oops! That would be something you never want. So in order to put these items, you can use a Tupperware holder. Roll out horizontal drawer is best for heavy objects like marble dishes and casseroles. Using pantry for dry goods. As I mentioned earlier, it is really annoying to look for things and not find them. You can place less often used dry things in the pantry. That will be the perfect place for them. But more often used things should be put into the cabinet or drawer close to the stove. If you love baking and do baking quite often like I do, then you should free up some space for the baking items too near your cooking range. I hope this article helps you in setting up your kitchen and using everything with ease and speed so that you enjoy when you cook or bake. Cheers!